Thought this'd be of some interest to folks into the Gorge's historical curiousities, but I randomly stumbled across an old spring with obvious man-made improvements on descending the northeastern ridge from Wauneka Point. The spring is backed by an old mossy retaining wall (couple feet high, perhaps 20-30ft in length) similar to those seen occasionally along the Old Columbia River Hwy (OCRH). There's a small basin - and, just below,half-hidden in the vegetation what looked like the remnants of a barrel-sized wooden structure surrounding a hole a several feet deep with water flowing through the bottom. (Nice place for the unwary to break a leg.) It's located near the mouth of Moffett Creek and south perhaps 0.15mi away from the bike trail. So probably not related to the OCRH, unless it was some old pullout or campground...or...?? Approx. loc: UTM 10 579849mE 5052521mN. I'm aware of other locations in the Gorge where pipes were used to tap springs or creeks higher up for power (ex: Herman Creek, Nesmith), tho' the flow rate here wouldn't seem to justify such an operation... particularly with the proximity of Moffett Creek nearby. Any old homesteads known to be in this area? There were lots of animal trails around the spring, although I did think, just prior to finding the spring, that the area I was hiking looked suspiciously like an old road grade. Possibly some more exploring is warranted hereabouts. mandrake wrote: It's located near the mouth of Moffett Creek and south perhaps 0.15mi away from the bike trail. So probably not related to the OCRH, unless it was some old pullout or campground...or...?? Approx. loc: UTM 10 579849mE 5052521mN. Can't quite get these co-ordinates dialed in. This is south of the new State Trail? 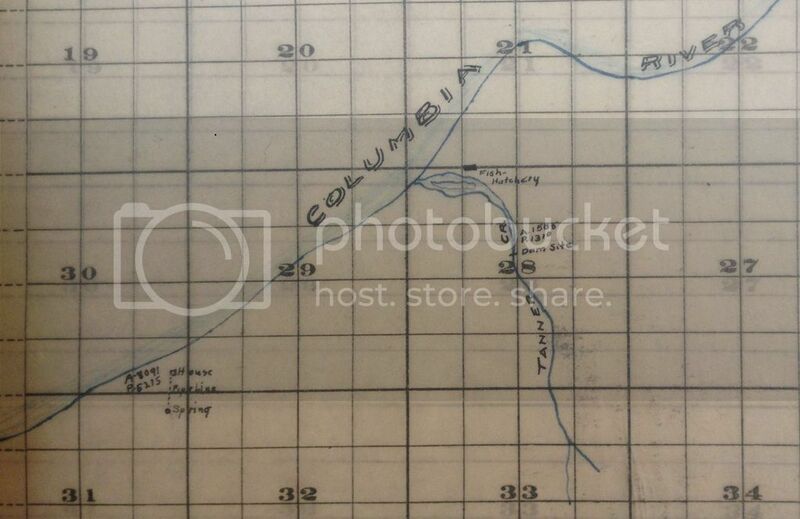 There was plenty of early activity in that area of the Columbia. A portage road operated on the Oregon side of the river from around 1861. You can see some early photos of the area if you scroll down at this site. You can walk a short section of the old route on the Tooth Rock Loop Hike, , and more traces of it are visible from Gorge 400 west of there. Also along Gorge 400, on the bench above Bonneville Dam, you can see where there used to be houses – there are some unnaturally level areas where daffodils bloom in the spring! 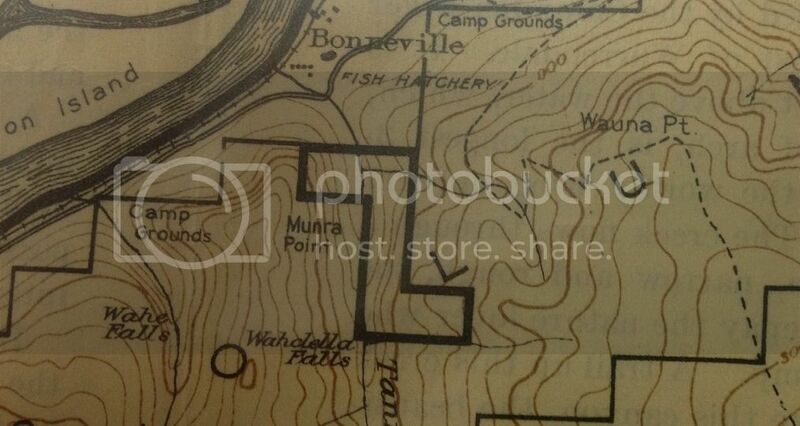 A sawmill was operating at Eagle Creek in 1867, and there was a Middle Blockhouse somewhere in the area. Those man-made improvements might have been done by the portage company, or possibly by the Forest Service as part of the “complete scheme of development”. mandrake wrote: It's located near the mouth of Moffett Creek and south perhaps 0.15mi away from the bike trail. So probably not related to the OCRH, unless it was some old pullout or campground...or...?? Approx. loc: UTM 10 579849mE 5052521mN. I'm aware of other locations in the Gorge where pipes were used to tap springs or creeks higher up for power (ex: Herman Creek, Nesmith), tho' the flow rate here wouldn't seem to justify such an operation... particularly with the proximity of Moffett Creek nearby. Any old homesteads known to be in this area? There were lots of animal trails around the spring, although I did think, just prior to finding the spring, that the area I was hiking looked suspiciously like an old road grade. Possibly some more exploring is warranted hereabouts. Looks like you are right, Lurch.